Pre-eclampsia is high blood pressure caused by pregnancy. It is one of the most common and life threatening conditions occurring in pregnancy and affects around 1 in 20 pregnant women. VCGS now offer Early-onset Pre-eclampsia (EO-PE) screening. EO-PE affects 0.3% of pregnancies and is defined as delivery prior to 34 weeks gestation. It is usually complicated by inter-uterine growth restriction and associated with poor placentation early in pregnancy. NOTE: The EO-PE screening test with a detection rate of 75%, at a false positive rate of 10%. The screen positive risk cut-off is 1 in 180. Why should I be screened for pre-eclampsia? Screening is a simple way to identify your risk of developing early-onset pre-eclampsia. Early detection and treatment can protect your baby and improve pregnancy outcomes. Without intervention, PE may affect the normal growth of the baby. Screening for Early-onset Pre-eclampsia is offered by VCGS as an option with the combined first trimester screening test (CFTS) - patients must 'opt-in' on the test request form. Screening uses the same blood sample collected for CFTS. Blood collected between 11-13+6 weeks (compared with 9+0-13+6 weeks for CFTS alone) to measure serum pregnancy-associated plasma protein-A (PAPP-A) and placental growth factor (PIGF) in maternal blood. In some cases, an ultrasound scan to measure the placental blood flow may also be performed. These results are combined with maternal blood pressure and family history information to provide a result. Please note: an early-onset pre-eclampsia screen result cannot be reported for twin pregnancies. Early-onset Pre-eclampsia screening is performed using the same blood sample that is collected for combined first trimester screening. See requirements. How accurate is Early-onset Pre-eclampsia screening? A reported Early-onset Pre-eclampsia (EO-PE) screening risk assessment has a detection rate of 75% for a false postiive rate of 10%. EO-PE positive rate cut off is 1 in 180. 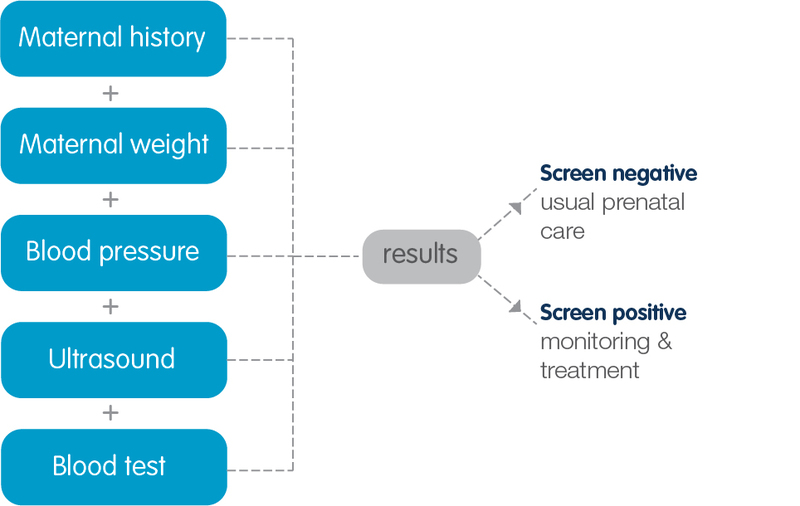 A screen positive result allows for early intervention and optimal patient care. As with all screening tests, there can be false positive and false negative results. Screening tests are not diagnostic – they are never 100% accurate. How much does Early-onset Pre-eclampsia screening cost? We have recently added Early-onset Pre-eclampsia screening as an option with CFTS. Early-onset Pre-eclampsia screening is not covered by Medicare. The patient out-of-pocket cost remains close to $100 and may vary depending on where you get your bloods taken. For first trimester combined screening, the out-of-pocket range is $92-$101 (Item #66750). For first trimester combined screening with Early-onset Pre-eclampsia, the out-of-pocket range is $111-$120 (Item #66750). For second trimester screening, the out-of-pocket range is $79-$88 (Item #66751). This does not include the cost of the ultrasound required for CFTS. The combined first trimester and Early-onset Pre-eclampsia screening results will be faxed through to your referring Doctor. Your results are usually available within 3 working days of the 12 week ultrasound report being received by the laboratory. A screen negative result means you are unlikely to develop Early-onset Pre-eclampsia. However, a screen negative result does not mean you definitely will not develop early-onset pre-eclampsia. With this screen result, you will continue to receive normal prenatal care. If your result is screen positive for early-onset pre-eclampsia, close monitoring is highly recommended. The chance you will develop early-onset pre-eclampsia is low, but your baby’s growth will be monitored closely by your Doctor. Your Doctor may recommend a low dose of aspirin during your pregnancy. Aspirin treatment may delay, or even prevent the onset of pre-eclampsia. I have received an invoice from VCGS - how do I pay? After testing is complete, patients will receive an invoice. This invoice is payable because your blood sample has been analysed by the laboratory. This can be paid by phone using BPAY or credit card, or by mail using a money order or cheque - payment methods are detailed on the invoice. To claim the Medicare rebate, take the receipt of payment to a Medicare centre or online. Once processed, Medicare will send you your rebate. If you wish to speak with someone about your invoice: Free call 1300 557 779. What does a low PAPP-A (<0.45 MoM) mean? A low PAPP-A is descriptive of poor early placentation and may result in adverse pregnancy outcomes such as mid trimester miscarriage, fetal growth restriction, intrauterine fetal death, preterm birth or pre-eclampsia. A referral to a specialist O&G service by 20 weeks gestation should be considered to allow for closer maternal and fetal surveillance. More information about interpreting low PAPP-A results can be found in this brochure.